Republican Rep. Billy Long of Missouri tweeted that members "held an impromptu service at 30,000 feet" for Dingell while circling above Detroit waiting for the weather to improve. "It did not and we're back," he wrote. Two of the members – Democratic Rep. John Lewis and Republican Rep. Fred Upton – were slated to speak at the funeral on Tuesday. Former Vice President Joe Biden was also set to speak and was not delayed by bad weather. Dingell's wife, Rep. Debbie Dingell, was also at the funeral. Tuesday's service in Dearborn, Michigan, was the first of two funerals this week to remember Dingell, the longest-serving member of Congress on record. He died last week at the age of 92. 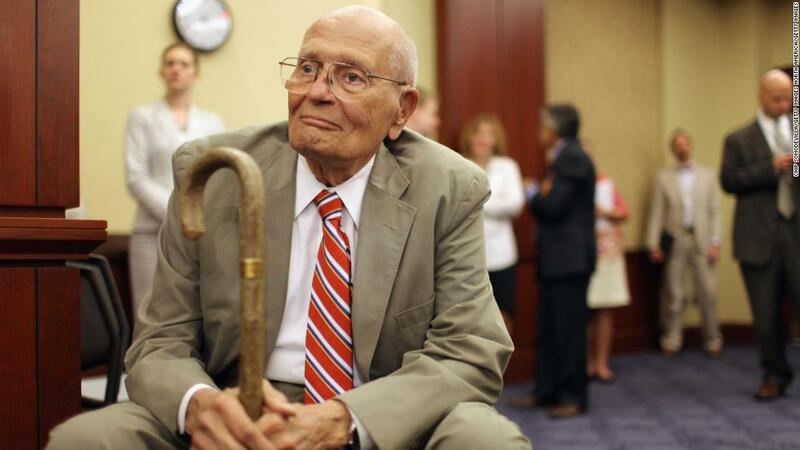 House members will have another chance to pay their respects later Tuesday afternoon, when a motorcade with Dingell's casket is scheduled to drive by the Capitol, and then again during a funeral service in Washington set for Thursday. CNN's Arlette Saenz contributed to this report.